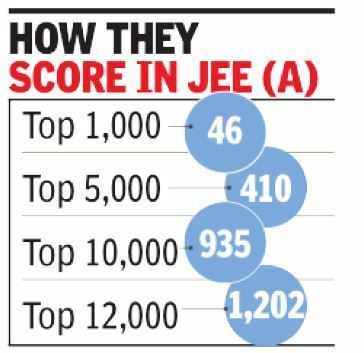 A mere fourteen girls have made the cut to the top 500 ranks of the IIT JEE Advanced exam, underscoring the gender divide in technical education at the elite IITs. The number of females rises to just 46 even when the list is expanded to the top 1,000 scorers (there were 68 girls on that list last year). However, under the HRD ministry’s gender diversity plan, at least 8% more seats (800 in all) will be added to IITs this year to accommodate more girls, thus enhancing female representation in popular streams like computer science and electrical engineering. The seven older IITs will have 3% girls in computer science with the female-only seats. Data from IIT-Kanpur shows 3,000-odd girls have been shortlisted by the Joint Admission Board from the top 24,500 ranks. Among the top 5,000 students, there are 410 girls, and in the top 10,000 ranks of the common rank list, there are 935 of them. Excluding the girls-only quota, the 23 IITs have 11,279 seats; the number of girls in the top 12,000 are about 1,202. A JEE chairman pointed out that mandatory reservation and addition of seats for girls was to ensure “14% girls in every programme”. According to the IITs, female candidates are eligible for a seat from the female-only pool as well as the gender-neutral pool of a program. A female candidate will compete for a seat in the gender-neutral pool only if she fails to get a seat from the female-only pool. “But if you see the number of female candidates in the top ranks, they are very few and most will opt for the female-only pool to get into a popular course and a better institute,” said a faculty member from IIT Bombay. Under business rules set by the IIT for seat allocation, the 800-odd seats for females will also follow reservation norms. For example, consider an OBC-NCL female candidate with a general rank. She will be first considered for a seat from the female-only pool of general seats followed by the gender-neutral pool of general seats for that program. If she does not make it, she will be eligible under the OBC category. Several attempts have been made in the past to ensure a larger share of girls at the IITs. Even the admission form’s cost was reduced on the C N R Rao committee’s recommendations. But that did not boost the numbers. Next year, according to the decision of the Joint Admission Board, more seats would be added to ensure that girls constitute 17% of total students. By 2020, the ministry aims to increase percentage of girl students at IITs to 20.